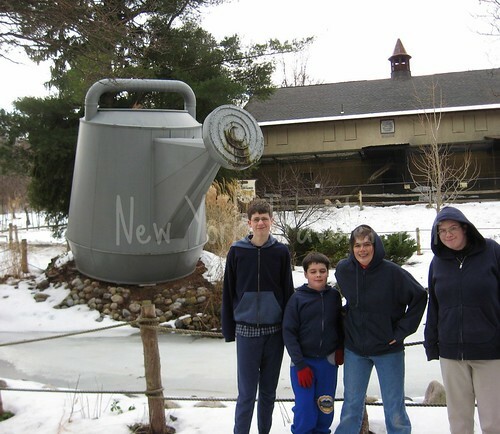 Over the winter, we drove the short distance to visit the Utica Zoo. 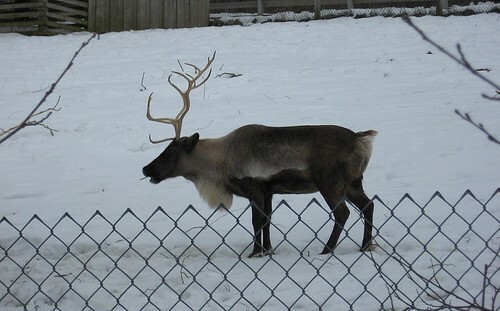 The Zoo is open all year round, but admission is not charged from November to March. Of course, during the warmer weather there is much more to see and enjoy, but visiting in winter is still very enjoyable. My kids absolutely loved our trip! 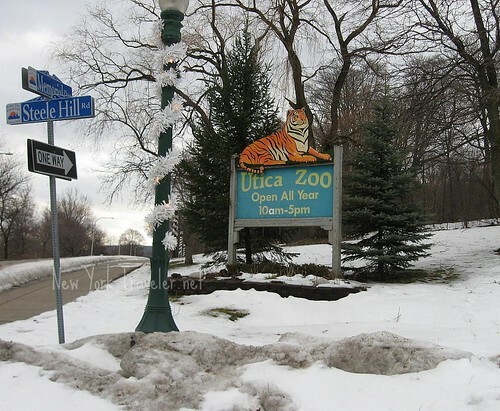 The Utica Zoo sits on top of Steele Hill Rd. in the city limits. The Zoo has existed on this site for almost 90 years; the land was donated by a local philanthropist (the same family whose house we visited last summer). 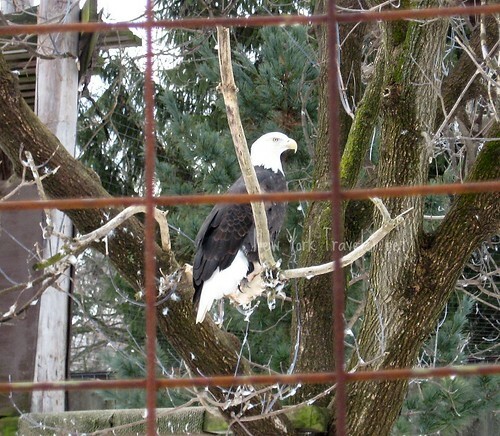 The city of Utica owns the Zoo, but does not provide any funding (which is odd). 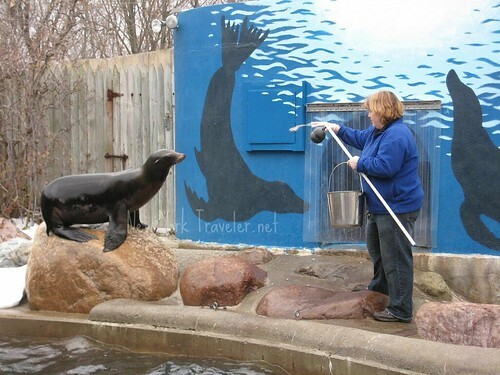 The Zoo relies heavily on donations, county funds, and admission fees to operate. I’ve heard about their various fundraisers and financial woes in the news. 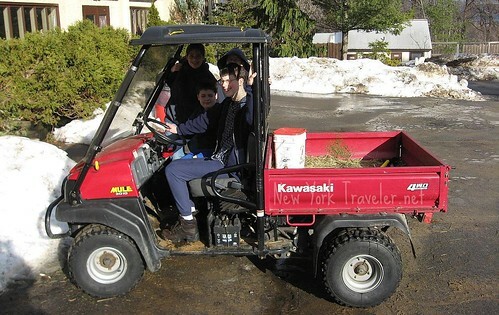 Last I heard, they were asking Oneida County to grant more money. I hope they got it; the Zoo is a wonderful asset to the county. 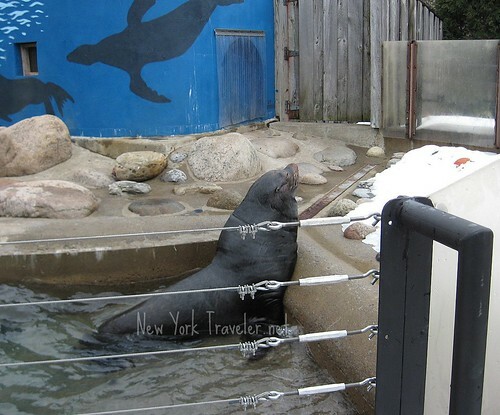 For such a small city, the Utica Zoo is a lovely zoo; there are over 200 animals here and all the zookeepers seem very devoted to the animals. About 100,000 people visit the Zoo every year. 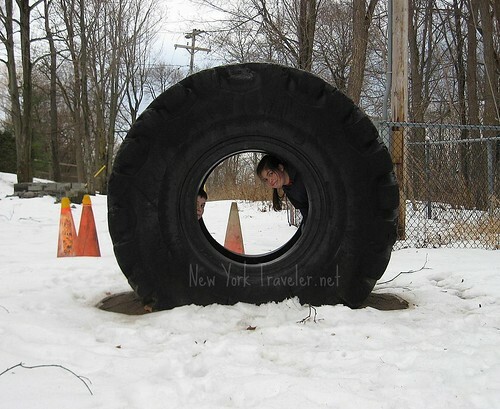 The Zoo is a bit unkempt (probably due to the winter weather), but if you ignore the animal droppings, unshoveled pathways, and scattered clumps of hay, you’re in for a fun time. 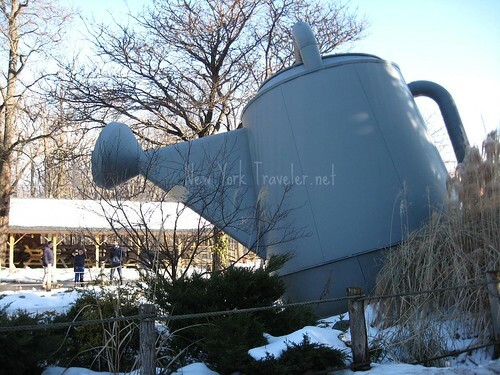 Did you know that the world’s largest watering can is at the Utica Zoo? It is! Here’s your proof! When we arrived (about 10:30am), the Zoo had few visitors. Things really started to pick up about an hour later. A lot of visitors were older parents and grandparents with very small children. 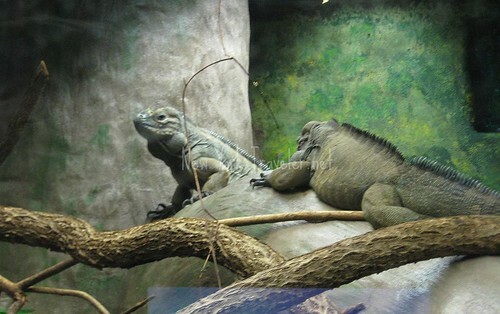 We went to see the reptiles (to get it over with). 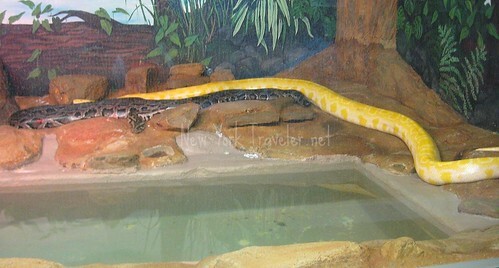 The snakes were kind of interesting, in a slimy way, but I didn’t see why the kids were so excited about them! The kids gushed over the lizards, the turtles, the geckos, etc. One big lizard had just received his breakfast but hadn’t eaten it yet: two dead white mice sagged on a nearby rock waiting to be swallowed. Ick! (are you grossed out yet?) I took a photo but it didn’t come out. 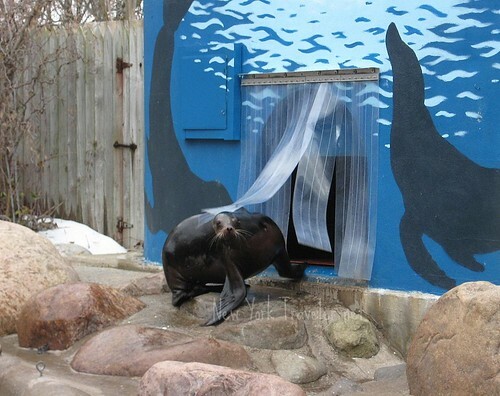 Come on, I know what you’re going to say…. “aw, rats!” haha! More lizards… they spit at us from time to time. I strongly suspect they knew about my aversion to slimy and scaly things. So, we meandered in the reptile area. Yawwwwn. Woh hoh! Those are Burmese pythons in that cage. It’s a little hard to see them because the glass is dirty and I’m still getting used to this camera. One of them is an Albino python and he was quite active. He watched us through the glass and skittered over to the other side of the den. His tongue flickered in and out as he watched us. Imagine seeing one of those babies in your backyard in Burma. 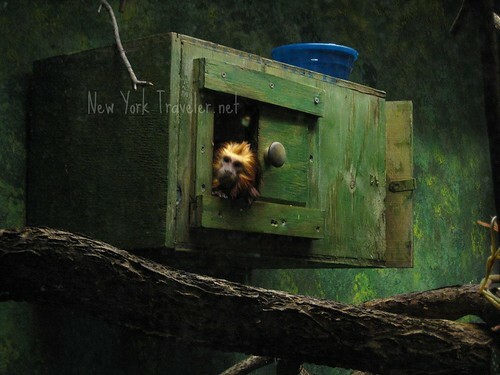 This cute Golden-lion Tamarin peeked out at us from time to time. 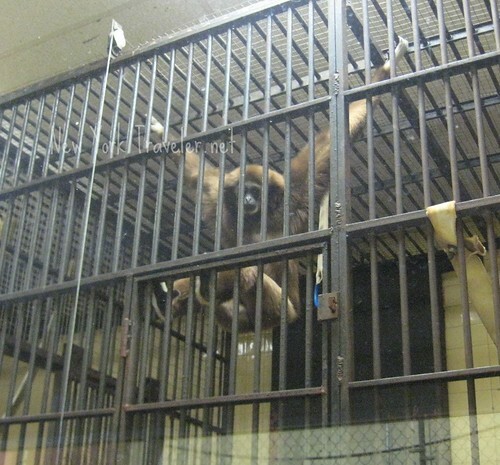 The Gibbon monkeys were very active, but whenever I switched to video camera mode, they stopped. 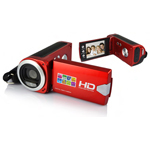 Now I just can’t believe they knew when I switched to video mode… did they? It was uncanny— as soon as I turned the dial, their frantic swinging came to a screeching halt. We wandered back outside to see if we could find the Siberian tigers. We have been to the zoo many times (when the kids were little), but it was always spring or summer. I’ve never once seen the tigers because they were always skulking behind bushes or trees. One the kids ran up to the fence and hollered that he could see the tigers! Such beautiful creatures! They kept their beady eyes on us, though. There was a sign by the cage reassuring visitors that these tigers cannot get out of the cage (I suppose this is in reference to a recent and deadly tiger escape at a zoo). While we watched the cats, a very shrill scream filled our ears. It startled me and I couldn’t place the animal. My son said it sounded like an eagle. we walked down the hill toward the screaming, and lo and behold…. We wandered around more. 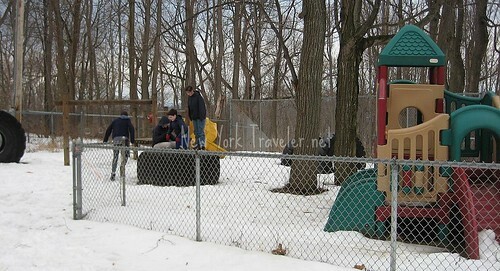 I found some more monkeys, playing on the playset! The sun came out for us briefly. The Zoo is not huge, but it is very scenic and there are some really nice walkways. 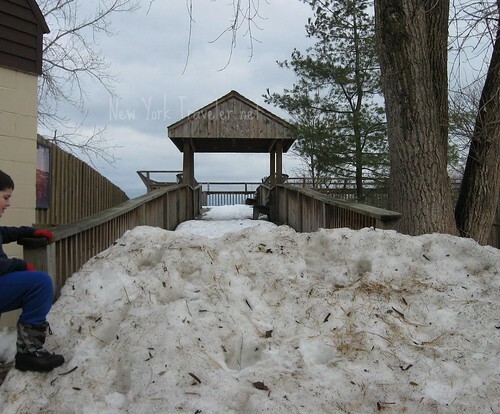 In the winter, you have to be prepared to do a little hiking over the snowbanks. There’s a nice wooden walkway that leads you to a deck. The deck takes you to the peak of the hill and you can look down to the city below. The view is stunning. We spotted the peaks of the Adirondacks to the north (look at the lighter colors in the skyline at the left of this photo). 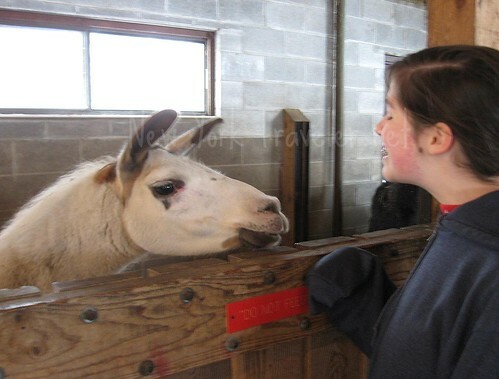 Some of the animals are quite affectionate. You can get up close to them and pet them. 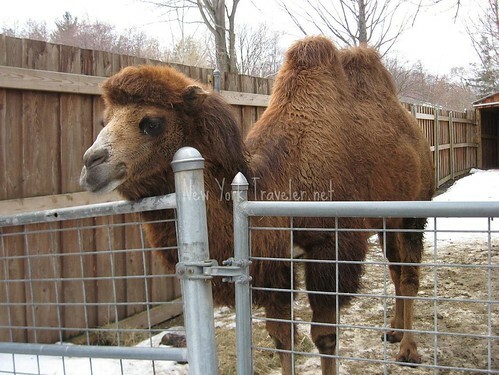 This Bactrian Camel was all lovey. She loved to chew her fence, too. 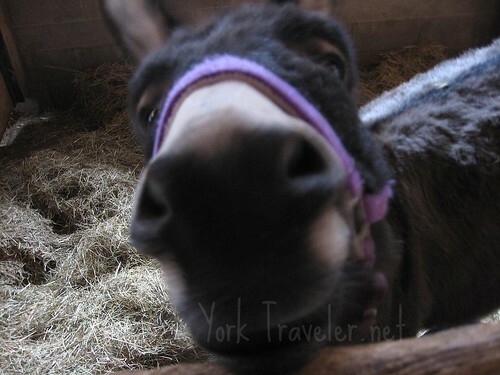 The donkey inside the barn was the sweetest little thing. He trotted right up to me to chew on my scarf (which was dangling over the gate). He let me scratch his head. Really cute! 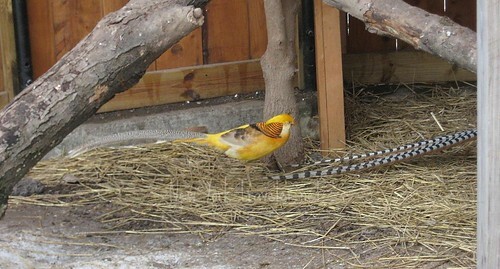 I snapped a photo of the most beautiful bird I have ever seen (besides the chickadee, I love chickadees): a Golden Pheasant. Beautiful! It daintily pranced around the other pheasant and a few preening peacocks. 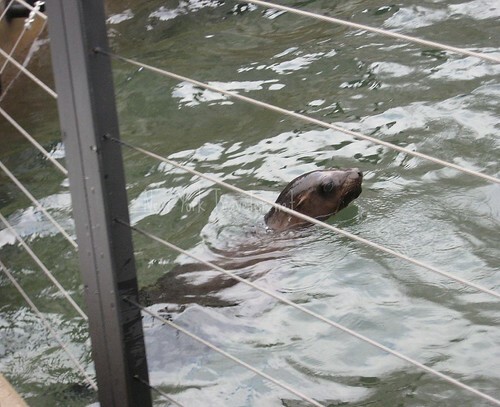 By far, the best part of the zoo is watching the entertaining sea lions. It was almost feeding time, and Munchkin and Lenny were frantically impatient. Every few seconds Munchkin would peer under the fence gate or poke her head through her door to search for the zookeepers. She acted just like my dog before supper time! (I have a beagle, so she resembles Munchkin, too). I got a short video of Munchkin swimming. (Sorry, it’s very brief). She kept bobbing her head and barking at us, as if we had fish for her. Lenny was more patient, but it was still obvious that he was hungry. Getting a photo of the new baby Pedipede Jack was more difficult. He was underwater a lot, and was a speedy little swimmer. Going to the zoo can be just as much fun as going in the summer. And the price is right, too! Wow, wonder how much water that holds. 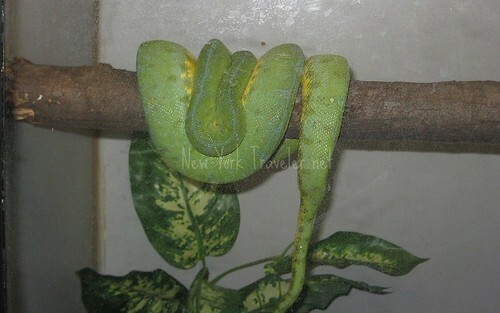 =) Have you been to the Bronx zoo? All I remember of the Bronx Zoo are the big gorillas and my sister throwing up from the stench of the bird area.